On May 12, 1870 the Canadian Parliament passed the Manitoba Act creating Canada's fifth province. Its name, Manitoba, was an Assiniboine word meaning "water of the prairie" because of all the lakes and rivers in the area. It included only a small square of land - about 35000 sq. km . - around the Red River Valley and Portage La Prairie. The rest of Rupert's Land became the Northwest Territories. 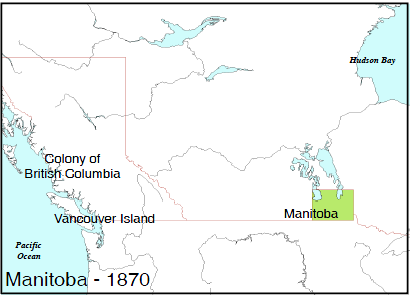 The Manitoba Act stated that Métis lands would be protected but all other lands were the property of the Dominion of Canada. The Métis could not get legal title to their lands until Dominion surveyors had finished sectioning the land - a job which took three years. After that, the Métis were issued with scrip - a piece of paper entitling them to 64 hectares of land. Because they had no experience with written laws, deeds or money, many of them did not understand the value of this scrip and were easily cheated out of the land which should have been theirs. After the first couple of years, though, they came to understand well how a land market worked and learned to sell their property for a profit. They continued to move further west in order to follow the diminishing buffalo herds and carry on the life they were used to, providing food and supplies to the fur traders.